The actor Yamashita Kamenojô I held this name from 1698 to the middle of the 1720s. Dates of birth and death unknown. 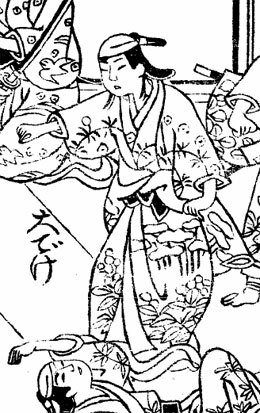 Disciple of Nakamura Shirogorô I, he started his career in the 1st lunar month of 1711 in Kyôto, performing as a wakashugata; his first stage name was Nakamura Mitsusaburô. He became wakaonnagata in the 11th lunar month of 1713, performing in the kaomise drama "Eitai Kogane no Ichigura", which was produced by Sakakiyama Shirotarô I in Kyôto at Kameya Kumenojô's theater. He joined the Shinozuka clan in 1715, becoming a disciple of Shinozuka Jirozaemon I. He became one more time wakashugata and took the name of Shinozuka Masanosuke in the 11th lunar month of 1715 in Kyôto at Hoteiya Umenojô's theater, performing in the kaomise drama "Manpô Chitose no Matsu", which was produced by Yamatoya Jinbê III and included a kôjô commemorating the sudden death of Kataoka Nizaemon I. He definitively switched back to female roles in the 1st lunar month of 1716, playing in the same theater the role of the keisei Koiso in the new year drama "Keisei Otokoyama". He went to Ôsaka in the 1st lunar month of 1719 and took the name of Yamamoto Somenosuke at the Kita no Shinchi Shibai, where he played the role of Manzai Otoku in the new year drama "Genji Shusse no Kadode", which was produced by Kokon Shinzaemon. He went back to Kyôto the same year and took back the name of Shinozuka Masanosuke in the 12th lunar month of 1719, performing in Adachi Saburôzaemon's kaomise drama "Yamato Ôji Meoto Izumi", which was produced by Sawamura Chôjûrô I. He became a disciple of Yamashita Kamenojô I in 1721. 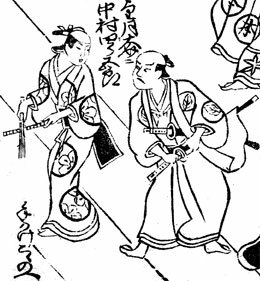 He took the name of Yamashita Kamenojô II in the 11th lunar month of 1725 at the Naka no Shibai, playing the role of the mekake Kokonoe in the kaomise drama "Hôraisan Imose no Matsu", which also celebrated the shûmei of Nakamura Shirogorô II (who was the adopted son of Kamenojô's first master Nakamura Shirogorô I). His last-recorded performance occurred the following year, in the 2nd lunar month of 1726 in the same theater. We don't know what happened to him afterwards. He was ranked one stroke below jô-jô [visual] in the 1st lunar month of 1726 Kyôto hyôbanki, wakaonnagata section. He was said to excel in keisei roles and nuregoto in sewamono dramas. The actor Sanjô Namie I held the name of Yamashita Kamenojô III from the beginning of the Genbun era to the 10th lunar month of 1743. The actor Yamashita Kamenojô IV held this name from 11th lunar month of 1777 to the end of the 1780s. The actor Arashi Kamenojô II held the name of Yamashita Kamenojô V from unknow times to 1815. 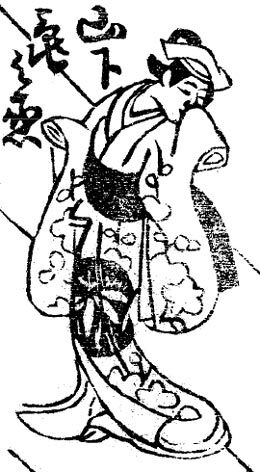 The actor Nakamura Tomiko held the name of Yamashita Kamenojô VI from the end of the Kaei era to the 10th lunar month of 1858.